The title might be a bit of a mouthful but this loaf cake is surprisingly simple! Packed full of sugar and spice this cake is the perfect winter treat. Scroll down for the recipe. If there’s an excuse to bake or eat cake I’m there. So when I moved to Enfield I was keen to get the Clandestine Cake Club (CCC) back up and running. That way I’d have an excuse to bake and eat cake at least once a month! We had our first meeting back in September when I made my Black Forest Cake. It was lovely meeting like minded people and gorging ourselves on cake and tea. If there’s a CCC near you I definitely recommend going along. The theme for this month’s meeting was Christmas and so I got to thinking about the kind of festive flavours I could include in my bake. A traditional Christmas cake seemed too obvious – and I’d already baked two for my family! I thought about using winter citrus fruits but wanted something a bit more bold. Some of the bakers that come to the CCC meet ups are professional bakers and so I really wanted to make something I knew I could execute well and would look pretty too. It had to be full of flavour, light and moist. I really couldn’t decide between a gingerbread loaf or a cinnamon loaf but when one of the other ladies said she was using ginger I settled on the latter. The second I smell cinnamon I think of Christmas so I knew it would go down well at our Christmas meet up. It’s one of those aromas that immediately takes me back to being a kid, baking in my Mum’s kitchen in the cold winter months. Even as a child I was fascinated by the fact that a dry bit of bark could create something so delicious! What was once considered an exotic spice, cinnamon is now a staple ingredient you’ll find lurking in most kitchens. The recipe for this Cinnamon Loaf Cake is actually a twist on a classic Ginger Bread Loaf, the main tweak being that I use ground cinnamon instead of ground ginger. (Not exactly rocket science I know). Whilst ginger has a fiery heat cinnamon is much sweeter and more mellow. This is what makes it the perfect partner for sharp cranberry compote. There’s also no denying that cranberries, with their shiny red coats, are thoroughly festive fare. In the UK, they only appear in the shops in December and I’m always super keen to pack them in to as many dishes as possible over the winter months. In the past we’ve had cranberries in Wild Rice Pilaf, infused gin, this festive eton mess and even nougat! Is there any recipe you CAN’T use cranberries in!? If you love these tart little berries as much as me then scroll down to the end of this post where you’ll find links to other cakes packed full of fresh cranberries. For my cake I wanted to make the most of their vibrant red colour so rather hiding them in the cake I decided to do a sweet and sticky mulled cranberry compote for the top. I took a punnet of fresh cranberries and heated them in a pan with sugar, a splash of red wine and traditional mulling spices such as cinnamon, star anise and some citrus zest. I cooked it down until it became a sticky sauce, allowed it to cool then drizzled it over the cake. With cream cheese icing and the cranberry compote you could never be accused of serving up a dry cake. Serve up this Cinnamon Loaf Cake this winter. Just follow the recipe below and you’ll have a tasty slice of cake in no time! Pre-heat the oven to 170C and line a 2lb loaf tin. Weigh out your dry ingredients and spices into a large mixing bowl. Place the water, golden syrup, sugar and butter into a saucepan and place on a low-medium heat. Warm the mixture gently until the sugar and butter have dissolved and formed a sticky syrup. Stir the syrup into the dry ingredients and beat well until smooth. Allow the mix to cool slightly if it hasn't already done so and begin to beat in the egg and milk. Finally pour the cake mix into the lined loaf tin. Place low in your oven (so that the top of the loaf tin is in the centre of the oven) and bake for 1hr 15mins - 1hr 30mins or until the cake is risen and springy to the touch. Allow the cake to cool in the tin for 5 minutes before removing. Store the cake in its liner until you are ready to decorate (best done on the day of serving). To make the icing, beat the butter with an electric mixer until light, smooth and fluffy. Add the cream cheese and vanilla and beat until well incorporated. Still beating, add the icing sugar a little at a time along with the cinnamon. Beat well until the icing is smooth and light. To make the compote, add the cranberries, jam sugar, red wine, spices and orange zest. Heat on a low heat until the mixture begins to bubble. Turn it up high, stirring frequently until the compote thickens (5 mins) then take off the heat immediately and allow to cool. Spoon the compote over the cake and serve. Not got time to make this Cinnamon Loaf now? Don’t worry, you can save it to Pinterest for later! Give it a like and pin it on one of your boards. Love cranberries? 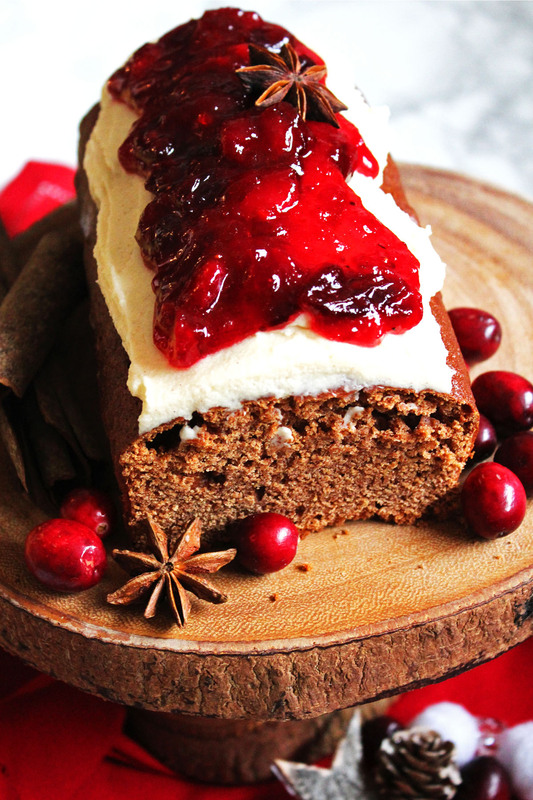 Then you’ll love these festive cakes that also have cranberries as the star of the show. What a fantastic loaf cake! I’ve wanted to join my local Clandestine Cake Club for ages. It sounds like fun. Haha thanks!!! Love the reaction 😛 just what I was after! Wow Emma! I am definitely going to make this at Christmas – it sounds heavenly!! Another twist on gingerbread (the treacly sort rather than the cake sort though) is to replace the ginger with the same quantity of liquorice powder. Then add a bit of black food colouring and you get a dark, sticky liquorice cake! Oh my goodness this is one gorgeous cake! I have to try your recipe! Please send in a pic if you do Sara 😀 would love to see it! Wow – all of those ingredients together look and sound amazing! I especially like the Mulled Cranberry Compote. Brilliant idea – I’ll be ping and sharing! What a beautiful cake! Festive and fun for the holiday season! 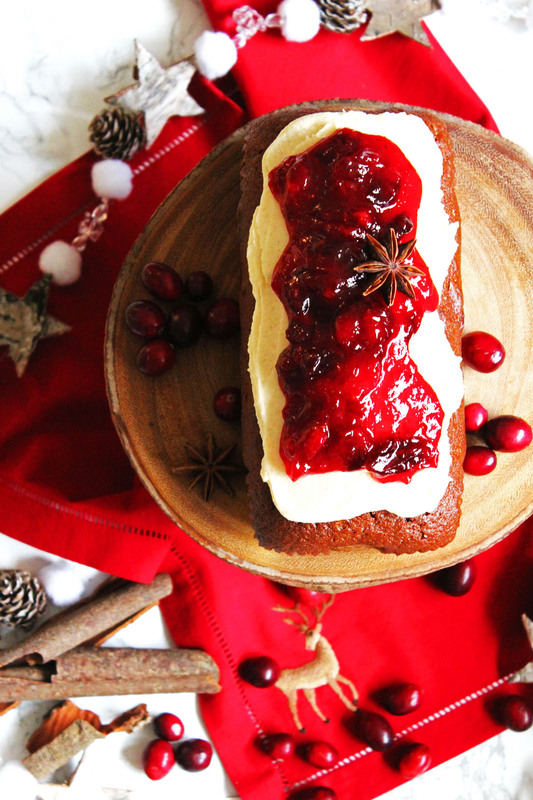 Your cake loaf photos scream of Christmas! Love the compote recipe ad the loaf ingredients.